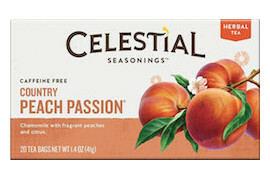 The sweet, juicy peaches chosen for this delicious blend bring to mind a decadent Southern delight - peaches and cream. We've added just the right amount of comforting Mexican chamomile and blackberry leaves to give a touch of international flavor to a delectable all-American favorite you'll savor both hot and iced. Ingredients: Rosehips, hibiscus, orange peel, roasted chicory root, chamomile flowers, blackberry leaves, natural peach flavor with other natural flavors, natural passion fruit flavor, peaches, and citric acid. Contains soy lecithin.